SENSEI DIRK HEENE 7th Dan. Interview By Philip Lehrer. MIZU NO KOKORO. By Mike Clarke. IS OI-ZUKI SHOTOKAN'S 'SIGNATURE' TECHNIQUE?By John Cheetham. KARATE IN MODERN JAPAN - THE REAL PICTURE. By Hamid Abassalty. IS SHOBU-IPPON RELEVANT IN TODAY'S KARATE? By Elwyn Hall. NORIO KAWASAKI 6th Dan. By Alexander Chichvarin & Yevgeny Ukolov. JKA GASSHUKU TOKYO 2007. Report By Angelo Sanna. SHOTOKAN KARATE MAGAZINE would like to pay a special tribute to commemorate this year being the 50th Anniversary of the passing of Shotokan's founder, Master GICHIN FUNAKOSHI who died in 1957. Funakoshi sensei was born in Shuri, Naha City, Okinawa Prefecture on October 10th 1868 and died on April 26th 1957. On Friday 20th April 2007 a stone monument was unveiled in honour of Funakoshi sensei. It's located next to the Okinawan Budokan, by the entrance to Gokokuji Park on the island of Okinawa. The inscription on the monument below is not only in written in Japanese but also in English and dedicated by the Okinawan Funakoshi Gichin Appreciation Society. As well as the inscription referring to his life and role in the development of Karate-Do, it is inscribed with Master Funakoshi's most famous saying... “KARATE NO SENTE NASHI” ... There is No First Attack in Karate! SKM would like to thank SKIF Kancho, Hirokazu Kanazawa who kindly donated the photographs of both the monument and the attending dignitaries. This rare photograph opposite sees Master Funakoshi being presented with a bouquet of Flowers at the Opening Ceremony of the Japan Karate Association (JKA), Tokyo, 1955. One of the original JKA Directors, Ito sensei, is on the left. (Photo By Hal Sharpe). Is Oi Zuki, The 'Signature' Technique of Shotokan Karate-do? Without question, oi-zuki (stepping punch) is a much used basic technique in the arsenal of Shotokan Karate-do. But is it the 'signature' technique? Some senior instructors go so far as to say that this technique is so special within the Shotokan style as to be a given the title of 'THE' most important single technique within the complete range of techniques at our disposal. Why is this? One answer could be that many believe that this (oi zuki) is the strongest of all the punching techniques for most practitioners (if delivered correctly), after many years of dedicated training. As mentioned elsewhere in this edition of SKM, oi-zuki, has all but completely disappeared from the competition arena these days, yet in the 1970's and 80's it was used frequently by famous world class fighters to great effect, scoring many ippon points, and not just waza ari. Names that immediately spring to mind are some famous JKA senseis and champions from the past like; Oishi, Yahara, Osaka, Isaka etc, who scored many times with oi-zuki in the 1970's. With Yahara and Isaka often stating that this was their favourite technique and still is to this day! Yahara in particular was a master at delivering a lightning fast oi-zuki, literally flying at his opponent and from some distance too! Isaka actually stated that oi-zuki should be singled out for 'special attention' and viewed as a unique, completely separate technique from other punches. 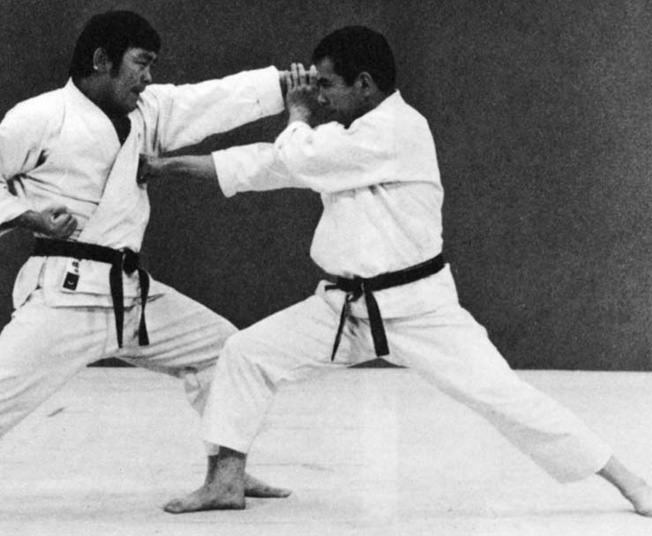 Former JKA Kumite Champion Oishi (right) scored many ippon points with oi-zuki in the 1970’s. In a previous article in SKM, Richard Amos stated that oi-zuki was 'the' most powerful of punching technique we have in Shotokan. Dave Hooper is another superb instructor who advocates special emphasis on oi-zuki. Having had the pleasure (!!!) of being partnered-up with Dave in gohon-kumite (five step sparring) many times, I can tell you that his oi-zuki either chudan or jodan is virtually un-stopable, even though you know exactly what is coming at you! It's just such a fast, smooth action (done correctly), moving/leading from the hips; it's very hard to spot the forward movement and get out of the way! So, this being the case, why is it not used in competition these days? What's gone wrong? All the evidence is there and yet, this special Shotokan technique (oi-zuki) is now only used (generally) in pre-arranged sparring like; gohon kumite, sanbon kumite, ippon kumite and jiyu ippon kumite. And of course in Shotokan kata. But rarely in competition! And yet, many people say that 'competition' is the nearest you can get to the real thing! And in terms of nerves, tension, dealing with pressure etc, then it's quite hard to argue with the case for competition 'not' being the closest we can get to a real encounter. If you compete, or have competed in the past, then you will know for sure that facing someone who you have never seen before, who's virtually frothing at the mouth with anticipation, is a totally different experience from facing a fellow member of your own club in any form of sparring you wish to mention, and of course in the comfort of your own dojo! So, I believe that for all the good and bad points about competition, (and there are many of both) then this fact probably out-weighs all the others. Dealing with fear and tension under pressure has been the downfall of many excellent technicians over the years! This is a fact! I don't know what it's like competing nowadays (I'm a little too old for that) but in the 1970's and 80's it was virtually a 'fight' with rules. There was a lot of heavy contact which would not be allowed in today's tournaments. So, it certainly was a frightening experience for sure, you could get hurt and no doubt about it! I've been observing people doing impact training for years on various targets; makiwara, punch-bags, impact shields, focus mitts etc, and rarely seen anyone practicing oi-zuki. Or rather not paying too much attention to this technique compared to others like gyaku-zuki and kicking techniques. And I think I know why ..... because oi-zuki is very difficult for many students to actually apply to a target. If the timing is not absolutely spot-on, then it fails miserably. The bottom line being that oi-zuki is in fact a damn hard technique to master. It feels fine to most students in fresh-air, in kata, or attacking an opponent in pre-arranged sparring etc, but impact training with oi-zuki is far more difficult than many other techniques that we use. I'd go so far as to say that it's probably 'the' most difficult hand technique to pull-off for the majority of students and that includes very high-grade karateka. One problem many people have with the difference between practicing oi-zuki within a Shotokan kata and then as described as impact training is this: and it is a contradiction and disagreement many karateka have, even with very senior Japanese senseis. In kata, we are always told to step smoothly, meaning don't 'stamp' around like a bull-elephant! I totally agree with this point; kata is meant to be powerful yet elegant, displaying gracefulness with a balance of strength and vitality but not an ugly, noisy exhibition of brute force. I think most Shotokan people will agree with those points. Now, you try doing a nice, smooth, 'noiseless' (no stamping sound when the front foot lands) oi-zuki when charging at a bag/pad to make maximum impact. It does not work! That front foot has to make heavy contact with the floor at the same time the punch lands, or you can't get maximum impact (because the front foot causes vertical shock through the floor at impact). I remember watching Kagawa sensei (a brilliant technician as we all know) a few years ago (1990) when he first visited England. He was doing heavy-bag impact training at Dennis Tilley's great dojo in Manchester after we'd just had a hard training session with Kagawa and I was taking photographs of him (for SKM) hitting the bag with various techniques, (one photo appeared on the cover of SKM issue 58 doing an amazing jodan mawashi geri). Kagawa sensei was also practicing hitting the bag with oi-zuki. Now, I personally was quite shocked at the time because it was a 'very noisy' affair! If you watch Masao Kagawa sensei performing kata, it's the epitome of smoothness and quiet movement from technique to technique, he moves with silky-smooth silent ease but incredible power, exactly as kata should be performed. It doesn't get much better than this! However, when he flew at the bag with oi-zuki, his front foot stamped down very, very hard and noisily as his punch made contact and put a huge dent in the bag! It was the absolute opposite to his oi zuki in kata in terms of noise and aggression. It looked like a different technique from the kata version of his oi-zuki. Now, in truth this contradicts what we have been told so often, especially by Japanese senseis, about not stamping around noisily when performing oi-zuki. But the truth is that if you don't make heavy contact with your front foot (even stamping down) when impacting on a target with oi-zuki, you won't get the best impact result. A nice smooth (kata-like) movement does not do the trick; try it and see. They have to be 'different'. Another point worth noting and observing is that when actually impacting with oi-zuki, it's virtually impossible to anchor the back leg/foot as we do in basics or kata. This can clearly be seen by comparing the photographs of Dave Hooper's basic (kata) oi-zuki in fresh-air, and Oishi sensei's oi-zuki as he makes strong contact with his opponent's chest in the other photograph. Again proving that some techniques have to change slightly (or sometimes drastically) when actually applying them and not merely practicing them by trying to make perfect form (read appearance). Yet another possible contradiction?you may say (?) Having said that, many instructors say that there is nothing wrong in changing a basic technique slightly to get the best effect when impact training, whereas it would possibly appear ugly if done whilst performing a kata. 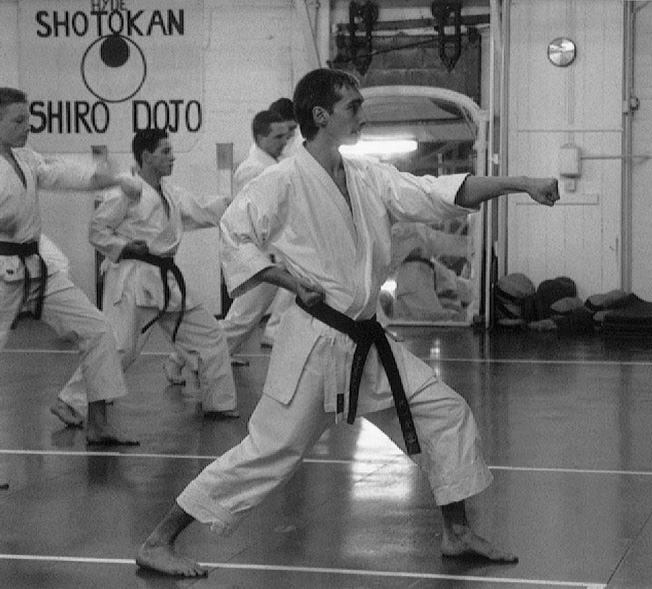 Dave Hooper 4th Dan JKA, performs oi-zuki whilst teaching at Dennis Tilley’s Manchester, (England) dojo in 1990. Dave displays a very smooth oi-zuki action: note position of back foot. There are of course people massively opposed to practicing oi-zuki, even within traditional Shotokan circles. But these are mostly people who focus on bunkai/oyo and its role in street self-defence and close-quarter combat training. Their main argument being that oi-zuki requires such a long travelling distance to be effective. And also they say that it is totally un-realistic in self-defence terms either as a pre-emptive attack, or a counter-attack, which is why many dojo's have stopped practicing basic ippon kumite using oi-zuki as the prime attacking technique. They now use gyaku-zuki. Again, the reason usually being the distance involved. Yet, by complete contrast many traditionalists swear by oi-zuki to actually improve overall body speed using forward momentum. From as long ago as Yoshitaka Funakoshi in the mid-40's the practice of oi-zuki was mainly done so as to make students improve their speed of movement over a long distance, in order to be much faster when in actual combat range. Many people think of oi-zuki as a technique which is simply part of the Shotokan tradition and as such must be practiced (even tolerated) simply to maintain that tradition. For instance, even some world famous instructors have said that oi-zuki is no longer a viable technique for competition and they prefer gyaku-zuki using yori ashi to make the distance instead of a lunging stepping punch. The argument being that the stepping/lunging leg action (oi-ashi) used in the basic oi-zuki punching technique originates from Kendo and no longer has a place in modern karate. So, some might say that the jury is still out on oi-zuki? Yet many Shotokan karateka favour continual practice of this technique and feel that it still has a vital part to play and is not just an out-dated kata movement. Surely it's far more than that, and many karateka believe, like the senior senseis mentioned earlier, that oi-zuki deserves special importance within Shotokan. So, is oi-zuki the 'signature' technique of Shotokan Karate-do? Or is it merely a technical relic from Shotokan history?